ABC Has Awarded Us Platinum Safety Status! We have been awarded PLATINUM status for safety from ABC. The Associated Builders and Contractors, Inc. conducts an evaluation of the safety training for companies of any size. 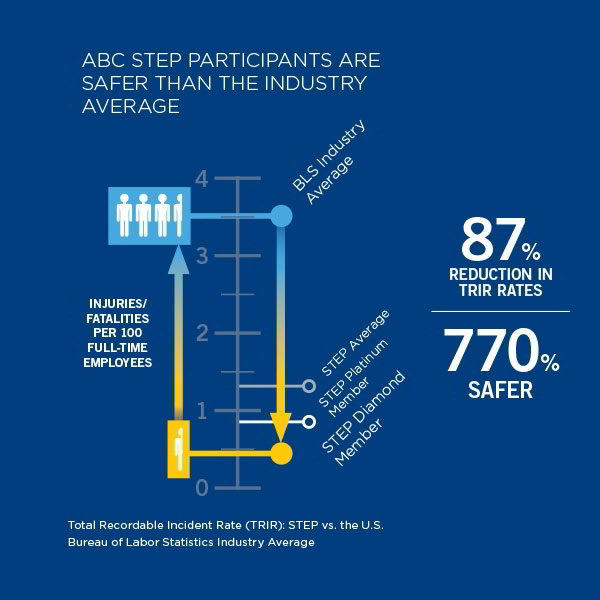 The Safety Training Evaluation Process (STEP), is a tool used for benchmarking and improving overall safety performance. With 70 chapters nationwide (of which one is right here in Lansing), ABC is on its way to becoming the leader in construction safety guidance and regulations. The fact is that safety performance isn’t reflected in what you did. It’s reflected in what you’re doing. Leading indicators lay the foundation for the evaluation process conducted by ABC. This is meant to identify hazards and also to attempt to eliminate potential injury. One-third of ALL incidents on a construction site are alcohol or drug related. A new hire orientation is where the culture of safety gets instilled. The earlier, the better. An on-site safety orientation is crucial in preparing team members to having specific information on how to work in that facility. Highlighting precautions in a small briefing on the jobsite can mitigate risks resulting in drastically reduced incidents. Employees in the field typically do no track near-misses. In order for safety precautions to get put in place, a near-hit analysis must be reported. Representatives, employees, contractors, and everyone else involved in a project ought to be conducting a Site Safety Committee to bring awareness to everyone involved. 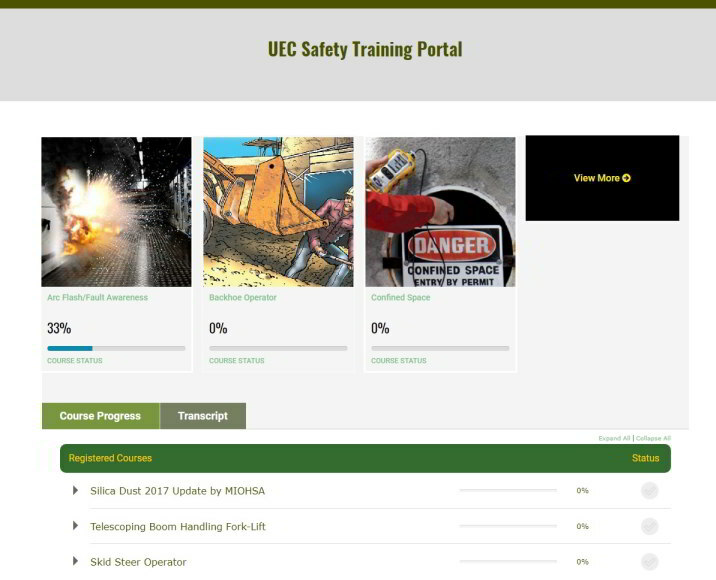 Every UEC employee goes through our training portal right here on this website; which is constantly evolving. Employees can follow the schedule set forth by the Training Director, or at a faster pace by completing the courses ahead of time; in whichever order. The course list contains, but not limited to, the following: Silica Dust 2017 Update by MIOSHA, Lift Truck Operator Safety, Telescoping Boom Handling Fork-Lift, Skid Steer Operation, Backhoe Operator, Wolverine Safety 301, Three Phase Motors, PPE Safety Awareness, MSDS Awareness, Man-Lift (Boom & Scissor Lift), Lockout Tagout Safety, Intro to Safety Construction, Hand & Power Tools, Fall Protection, Fire Extinguisher Safety, Electrical Safety Construction, Construction Safety, Confined Space, and Arc Flash/Fault Awareness.